The World Health Organization (WHO) will declare polio a global health emergency this week. Although they claim they lack the sufficient funding to take on this endeavor, Sona Bari, spokeswoman for the polio eradication program at WHO, said the world faced a “now or never” moment. ...with 650 cases around the world. They will focus their efforts in these countries. WHO is seeking to secure $1billion to add to their existing funds. They will bring this topic to the attention of ministers of health at the World Health Assembly in Geneva, Switzerland this week. They hope to coerce polio-free countries to donate money. They also suggest that officials from polio-free countries have officials at airports to administer vaccinations to people at arriving from affected nations. The Bill and Melinda Gates Foundation has poured millions of dollars into supporting Global Alliance for Vaccines and Immunizations (GAVI), a UN agency that also works in conjunction with WHO to administer vaccines to under-developed nations. WHO and GAVI teamed up with the World Bank and United Nations Population Fund in the 1970′s under the Task Force on Vaccines for Fertility Regulation. GAVI is heavily funded by the Bill & Melinda Gates Foundation for the global vaccination projects. Gates and WHO were in India vaccinating children for polio in when a strange case of non-polio paralysis began to strike those that had recently been vaccinated. 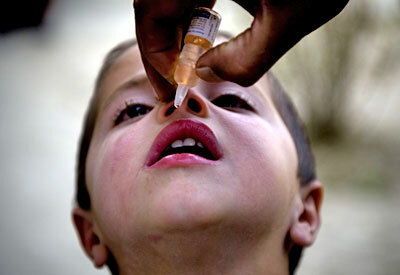 GAVI were blamed for deaths in Pakistan when they came in and administered polio vaccines that resulted in casualties. It is widely known that polio vaccines are the leading cause of polio paralysis. India has found that 100-180 cases per year are directly correlated with polio vaccinated areas. Although vaccine-associated polio paralysis (VAPP) is recognized, these cases of NPAFP are too extreme to ignore. And so is the cause of this disease. There is also suspicion about WHO’s need for dire amounts of vaccines after the CIA scandal where the US agency used fake hepatitis vaccines in a campaign to gather terrorist intelligence, through obtaining DNA in Pakistan. CIA agent recruited Shakil Afridl, a Pakistain doctor to head the fake vaccine drive. After Afridl was arrested, the plan was exposed. CIA wanted DNA from Osama bin Laden’s children. Afridl procured funds and proceeded to administer free hepatitis B vaccines in collaboration with local health officials. During the fake campaign, many thousands of Pakistani children were vaccinated. It was during this time that non-polio paralysis became an issue among the vaccinated children, which exposed a depopulation agenda as well as a scheme to use vaccines as a coercive way to obtain DNA from children under the guise of locating Osama bin Laden. However, WHO has the support of fatwas (religious rulings) from clerics worldwide that are advising parents to vaccinate their children and disregard the rumors that vaccines are “un-Islamic”. Sami ul-Haq, a religious leader and “father” of the Taliban, is one of their biggest proponents. Ul-Haq was behind a large immunization campaign at his madrassah where he demonstrated the need for vaccines by publicly vaccinating his own grandson. Governments and WHO are collaborating to force tens of thousands of children in tribal areas on the boarder of Afghanistan to be vaccinated. They have set up patrols to intercept parents that are fleeing populated areas in a forced immunization campaign. Dr. Nima Abid, head of the WHO polio efforts, estimates that after they will have to vaccinate an estimated 50,000 children. Some medical officials in India are privy to the agenda behind the surge in vaccinations.